The troop build-up along the border between Ethiopia and Eritrea means a miscalculation by either side could result in open conflict, the UN warns. Ethiopia is now estimated to have nearly half its armoured units in the area. Eritrea has sent troops into the demilitarised zone on the border. 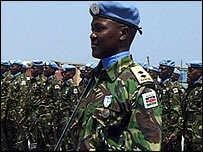 UN troops say Eritrean restrictions on patrols and helicopter flights mean 60% of the border cannot be monitored. Ethiopia and Eritrea fought a two-year war over the border that ended in 2000. "When you have reduced monitoring on both sides, there are dangers that the chances of miscalculation increase. And that is our greatest worry," said UN peacekeeping commander Major General Rajender Singh. ""I am not saying that things which are happening today will lead tomorrow to war. But a situation may in fact deteriorate to that level in which the worst can happen. And the worst is the war, of course." The UN has reassessed the border situation between the two countries from "stable" to "tense". UN Secretary-General Kofi Annan said he was very concerned. He called on both sides to "exercise maximum restraint and to immediately halt any action that might be misinterpreted by the other side" or that could jeopardise security arrangements agreed in their 2000 peace plan. 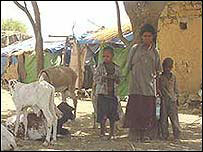 Ethiopia has not withdrawn its troops from land awarded to Eritrea by an international demarcation commission. The head of UN peacekeeping, Jean-Marie Guehenno, said he had briefed the Security Council members about the gravity of the situation and the engagement of member states was now essential. Diplomats in Asmara are waiting to see the final version of the latest UN Security Council resolution, which will probably be finalised in about a week. Previous resolutions have failed to put pressure on Ethiopia to implement the border demarcation agreement. BBC Asmara correspondent Ed Harris says the result of such weak resolutions is usually disappointment among most diplomats in Eritrea and fury from the Eritrean government. Last week, Eritrean President Isaias Afewerki said in a letter to the Security Council that it had lost credibility by failing to force Ethiopia from the border town of Badme, which was awarded to Eritrea by the boundary commission. Diplomats say neither side is necessarily intent on war and Eritrean Presidential Adviser Yemane Ghebremeskel described the reports of military movements towards the border as "irresponsible". But there are fears that the restrictions on peacekeepers could cause a small incident to escalate into something more serious. Eritrea became independent from Ethiopia in 1993, two years after Ethiopian and Eritrean rebel movements had jointly overthrown the brutal Derg regime in Addis Ababa. This week more than 30 people have died in Ethiopia's capital as security forces suppressed opposition protests over elections they say were rigged.